Workplace accidents and injuries happen every day. If you have been hurt while on the job, do not hesitate to contact our firm today for counsel! The Boles Firm is prepared to help you pursue fair compensation for your claim. We truly care about helping our clients get the support they deserve. Call our firm now at (215) 259-5879 to get started! We offer free, initial consultations. We are passionate about helping injured workers get the compensation and comfort they deserve. 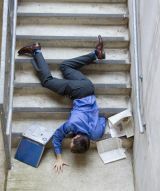 Whether you suffered from a slip and fall accident or were injured due to malfunctioning equipment, our firm is ready to represent your rights. The Pennsylvania's Workers' Compensation Act ensures that you will receive compensation for medical expenses and any wage-loss if you have been injured while on the job. If you need counsel pursuing this compensation or have been denied benefits for any reason, our legal team can help you. You can also call on us for counsel regarding rights of injured workers, types of compensation available, and other related legal matters. Contact The Boles Firm for your free case evaluation! If you or a loved one was hurt or killed because of a job-related incident, hire us to protect your rights. Our Philadelphia workers' compensation lawyers have decades of experience and are certified specialists in the field of workers' compensation. We go above and beyond to ensure that our clients enjoy the smooth recovery and support they deserve. Call The Boles Firm today to request your free case evaluation.